Vong takes a break with Ethan and Aiden at a picturesque spot on Mount Santubong during a different hiking expedition. MOUNT Santubong is a legendary landmark that never ceases to amaze. Locals or visitors who have set foot on the mountain – whether at the bottom or the top – will tell you how they admire its flora and fauna and panoramic view. According to folklore, the mountain is steeped in legends and myths on how it came to exist and got its name. Mystical fascination aside, records show the area around the mountain was explored by English naturalist, explorer, geographer, anthropologist and biologist Alfred Russel Wallace, considered the 19th century’s leading expert on the geographical distribution of animal species, and sometimes called the ‘Father of Bio-Geography’. Fast forward to the present, the pristine mountain environment and the locales are still very much prime attractions for both locals and visitors – even more so now with good road connectivity. There are international holiday resorts and holiday camps in the vicinity and the renowned Rainforest World Music Festival has its unique setting at the foot of the mountain. Vong follows the path flanked by dense vegetation along the summit trail. 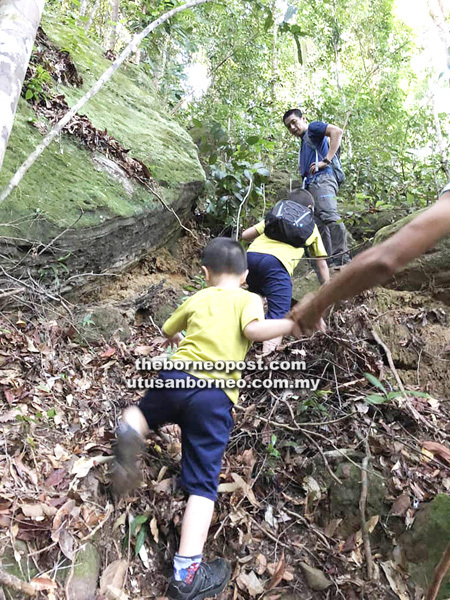 thesundaypost recently met up with a seasoned outdoorsman from Kuching, Ian Vong Ka Fatt, who has possibly explored every corner of Mount Santubong – its formidable terrain and diverse ecosystem. It’s a challenge the inveterate outdoor enthusiast loves to take on but mere mortals like most of us can get put off by it – without even trying. In April this year, the 44-year-old and his regular fellow hiker Patrick Mat, followed a backwoods path – probably never attempted before – up the legendary mountain. They chose what is believed to be the toughest route, trekking 33km through Mount Santubong’s seven summits to reach the top in 32.5 hours. Vong is very fit and loves endurance activities that many of us like to watch but would probably give tons of excuses not to try. Vong trains his sons to walk up a trail. Over a cup of coffee, he showed thesundaypost pictures and videos he took of the Mount Santubong summit trail. From his hiking stories, Vong comes across as a natural outdoors person and the al fresco adventures he and his friend share on the rugged mountain trail are not for the fainthearted. Although an endurance athlete, he looks like Joe Bloggs if you happen to bump into him on the street. Relating the incredible hike, he said they started out at 4am on April 14 and completed the “toughest challenge” he had ever encountered at 12.30pm the next day. “Exhausted but jubilant – we had done the seven summits to reach the highest spot,” he said. According to Vong, the trail has very rugged terrain and only by using a special tracking device were they able to figure out the lay of the land. “The special device does help but the reality is quite different – you still need to know your stuff – the knowledge of the area plus your climbing experience. Vong finds endurance activities exciting, but more importantly, he believes they help one to do the tough things with a positive attitude. He said endurance athletes needed to be determined and perseverant and constantly push themselves. Since tackling the seven-summit trail is no child’s play, being fully prepared is a top priority. For the 32 1/2-hour ascent, Vong and Patrick made sure they had sufficient food and drinks. They also brought along essentials like headlights, medication and ointment, emergency blankets or fly sheets for short naps or rests, and raincoats. “Never take anything for granted,” Vong advised. Vong climbs up a latch on a tree root along the trail. The duo trained by climbing hilly areas of the mountain and making a few survey trips. They also stuck to a healthy diet and got enough rest and sleep at least two days beforehand. After the successful hike, Vong said he felt a strong sense of physical and mental accomplishment. Vong pointed out that despite making adequate preparations, climbing Mount Santubong through the seven summits was no easy task, especially without a guide. “No one has ever tried this trail before and there are no markings. The constant dangers are the slippery ground after the rain, the steep terrain and sheer cliffs. He said conquering the seven summits also made him realise the mountain was not all about legend and myth. “It teaches you a lesson in humility. You feel humbled by the whole experience – completing the climb via a largely unmapped route and getting the rare chance to see the incredible flora and fauna and gushing waterfalls en route to the top. Vong also pointed out that hiking along the one to seven summit trail was no weekend walk but a very vigorous activity suited for endurance challenge seekers. Regardless, he encouraged people to keep an interest in outdoor activities to stay fit. And he is happy his two children, Ethan, aged eight, and Aiden, aged five, are following in his footsteps. 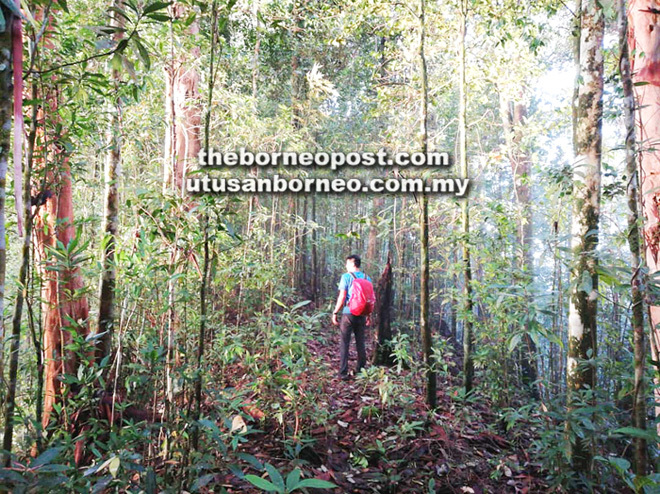 His other hike in the same vicinity took him along the Santubong Ultra 42km Off Trail on May 12-13. He is also targeting other localities – among them the Bengoh Range.